The Tool Cupboard is essential for any base because it prevents people who are not authorized from upgrading building blocks and placing and picking up deployables within a 25-meter radius (around 9 foundation blocks) from the cupboard. If you press 'E' on the cupboard you can authorize yourself so you are able to build in this area. If you hold 'E' on the cupboard you can clear the list of players authorized including yourself. Any player authorized from the cupboard will not be targeted by any flame turrets or shotgun traps within the cupboard's radius. 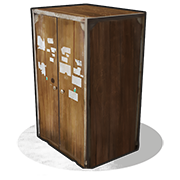 Tool Cupboards can be locked with Key and Code Locks in order to disallow players from authorizing themselves without a passcode. When destroying a tool cupboard (TC), you can get the amount of explosive rounds down a couple if you let the fire burn the TC. I can usually do it in 8 from a semi-rifle. If you're not in a hurry, saving the extra couple of bullets could be worth it. It only takes 5 12 Gauge Incendiary Shell to destroy a TC. If you shoot the shells above the TC and let the fire burn you can destroy with minimal resources! Very useful to craft when you lack inventory space but find lots of wood. Simply craft a lot of Tool Cupboards, and cancel the first in the Crafting queue when it's about to craft to reset the timer.